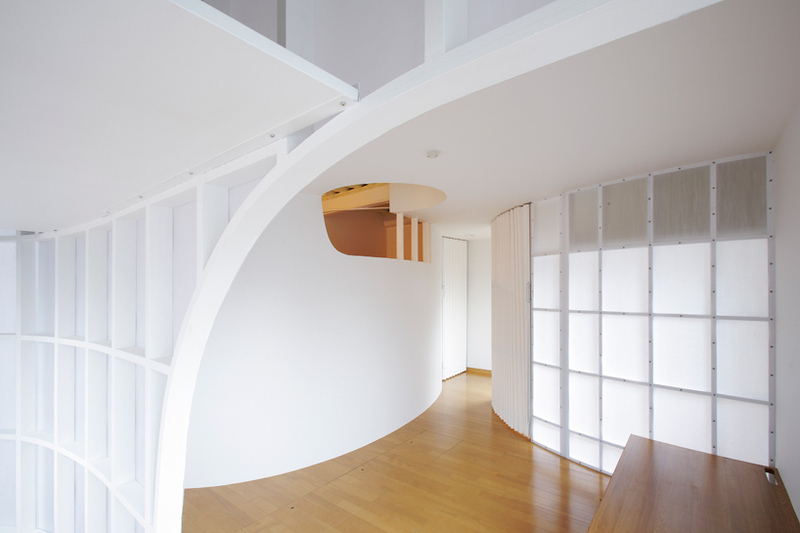 japanese architecture practice kihon form has shared with us images of ‘house in hanazono’, an interior renovation to a 25-year old building in osaka, japan. conceived for a family of seven, the design utilizes curvilinear partitions to carve out freely-forming programs that visually continues the space from one area to another. situated in a highly dense area of the city, the design aimed to break free from the orthogonal grid of the neighbourhood with an interior that organically flowed with the circulation. the former rectangular walls of the building were removed and appropriate volumes of programs were first established. the introduction of a curving partition enabled the house to make the most of the small area, arranging a denser collection of rooms without compromising on the open sense of space. the armatures of the curving walls are wrapped in translucent laminated japanese paper, allowing light and movement to softly translate to the other side. while a level of privacy is established, the inhabitants remain connected throughout the house. at night, the use of artificial light provides a ‘japanese lantern effect’ to the walls. I appreciate the effort but the result looks like temporary exhibition decoration, not structural.